It’s great to talk and be heard. But it’s also great to listen and learn. The good news is, this series helps you do both. (And have lots of fun too.) 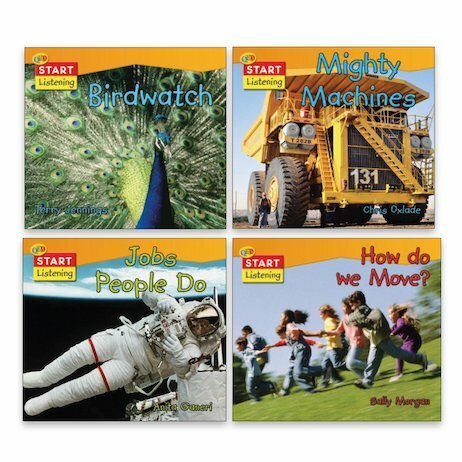 Fact books for curious kids, which help you take a fresh look at your world and build your communication skills. You’ll start by exploring four best-loved topics. Read the easy text on your own, or listen as it’s read aloud to you. Finished? Great! Now it’s onto the smart part: the cool ‘what do you think?’ section. How do firefighters put out large fires? What moves your bones? What pushes a shuttle into space? If you’ve listened well, you’ll know the answers – and now it’s your turn to talk! Start Listening: How Do We Move?